Homemade falafels are delicious and worth making. After experimenting with various falafel recipes, I came up with this version, which is now a favourite in my family. This recipe is made with natural ingredients and it satisfies both vegan and non-vegan palates. Among the ingredients is some grated carrots. I find that the sweetness of the carrot blends nicely with the savoury garlic and warm-peppery spices and fresh herbs. After frying, the inner part of the falafel is soft and the sesame seeds give it that extra outer crunch. To be frank, I’m not a fan of deep-fried foods, but when it comes to making a good falafel, frying is the only option. There is no other way. And, if you use a heart-healthy oil for frying, as in this recipe, then you end up with a nutritious food that is high in protein and relatively low in fat and cholesterol. Also, if you eat falafels with a salad or fresh vegetables, then what you’re eating is basically health food. For a complete meal, I like to serve falafels with tabbouleh – a traditional Lebanese salad that my husband John, who is half Lebanese by descent, grew up with. Here are the recipes for falafels and tabbouleh. Have fun making them and…bon appétit! Makes about 35 tablespoon-size balls. Soak the dried chickpeas overnight in a bowl with plenty of cold water. Drain and spread the peas on a clean tea towel to dry. Put them in the food processor and process. The beans should be mixed to a paste, but still lumpy looking. In a medium-size frying pan, add one tablespoon of oil and heat the oil. Sauté on medium-low heat the carrots, onions, garlic, cumin, coriander, cardamon and ginger for 2 minutes – until carrots and onions are soft and the spices are fragrant. Incorporate the onion and carrot mixture with the beans in food processor and process just enough to mix the ingredients. At times, you may need to stop the processor to scrape the sides and process again. Make sure that the mixture is evenly processed. Add the coriander and parsley leaves, cayenne, flour, oil, salt and pepper and keep processing. 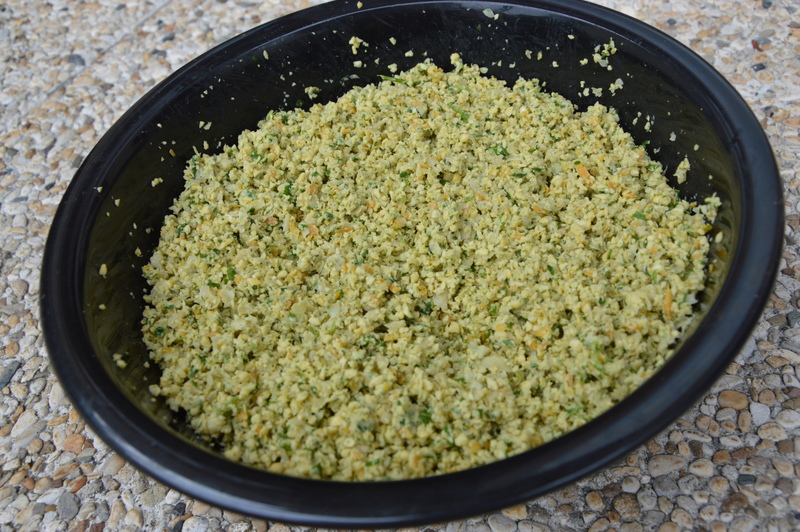 The mixture should look like the texture of couscous and a paste. It should have the consistency of a lumpy paste. Don’t overprocess it – you don’t want it turning into hummus! Pour the mixture in a bowl and cover it. Chill in refrigerator for at least 1 hours. Form flattish balls by pressing the mixture with cold wet hands. You can also use an ice-cream or a falafel scoop. The mixture will feel delicate, tender and almost flaky and not easy to handle. That is normal. It’s the right texture to a great falafel. It’s fine if the balls aren’t perfectly round or oval. Roll the balls in the sesame seeds. The seeds helps them bind and give them an outer crunch. Fill a small deep skillet with oil – about a depth of 3-4 cm; or just enough oil to fry the botton half of the falafel balls. They shouldn’t submerge in oil since you will be flipping them and frying them one side at a time. I use a light, good quality oil such as vegetable or sunflower seed oil for frying. When the oil is ready for frying, do a small test with one falafel to check the temperature. The temperature of the oil should allow the centre of the ball to cook and the outer layer to turn golden brown. Once shaped, spoon them gently into the frying oil and you’ll see how the balls will quickly bind and stick together. Fry the balls in batches of 5 or 6 at a time. Fry them for 2-3 minutes on one side, then flip them on the other side and fry for another 2-3 minutes. When golden brown on both sides, remove the balls with a slotted spoon and let them dry on a paper towel. Do the next batch. Put the dry bulgar wheat in a medium-size bowl and soak in cold water for 20 minutes (not longer). Meanwhile, continue with the recipe. Wash and pat dry the parsley and mint leaves and remove thick stems. Put both parsley and mint leaves in a food processor and process just enough so that the leaves are finely chopped. This should not turn to liquid. Put chopped leaves in a large salad bowl. With a knife, finely dice the onions and tomatoes and add these with the tomato juices to the parsley and mint leaves. Drain the wheat after 20 minutes and squeeze by hand all excess water from the wheat. Add this to the parsley, mint, tomato and onion mixture. Toss well with clean hands. For the lemon and olive oil, this part depends on how you like your salad and how big your salad is. Drizzle a little olive oil and alternate with drizzling a little fresh lemon juice. Keep drizzling these two ingredients in the salad and keep tasting the salad until you feel there’s enough oil or lemon. You want to blend both lemon and olive oil flavours in the salad, but these liquids shouldn’t weigh the salad down. The salad should be moist but not wet. If you want the salad to taste more lemony, then add more lemon juice. If you want more moisture, then add more oil. Note that the olive oil and lemon will help soften the bulgar wheat, which may still be a little hard. Cover and put in fridge. The salad should marinate for a few hours whilst tossing it from time to time. Adjust salt, pepper, lemon and oil before serving.